I almost avoided writing about this. Every single automotive blog, website, forum, news agency, etc has written about Top Gear’s demise. I’m sure even some Old Order Mennonites found the news disturbing. But why would so many people defend someone who did something clearly in the wrong? Its because we loved that damned show. Period. Lets look back a bit first. Have you ever watched the original Top Gear? The ones that ran from 1977 to 2001? I’m fairly certain they were produced by the same people who made workplace sexual harassment videos. They felt, dare I say, informative. As if National Geographic and PBS had pooled together their cinematographic talent. The only name you might recognize in the casting is in fact Jeremy Clarkson himself, who can be found from 1988 onward. James May had a year too, but there are a slew of presenters you don’t know, in episodes you probably haven’t seen, talking colorlessly about cars in the Queen’s English. All told its was dull. Now Top Gear UK is considered the standard. Every automotive show must live up to its quality or face an onslaught of criticism. The popularity of the show has lead to a few spin off productions, including a failed Top Gear Russia. That said, I genuinely find Top Gear US to be decent. While the chemistry isn’t perfect, its close. I have little insight into how the show is scripted or what level of involvement the presenters have in developing the episode, but I feel like there is potential. If you don’t agree, well, try to do to better yourself. That said, some have done just this thanks to the freedom the internet provides. Might Car Mods, a YouTube success story, has been able to attract a large following. What about other shows? If your an American motor head, you’ll be familiar the Power Block on Spike TV. When I was younger, I worked Sundays at a janky service station and made sure to watch the whole series. It wasn’t even a good program. It was more of a cooking show where you see a pile of parts, then viola! a completed rear end. But it was better than anything else on because I loved cars. I didn’t mind the repetitious nature of muscle car builds or rock crawler axle swaps. I’ve never even owned a 4×4 (surprisingly). Other shows simply flopped. Ones that tried to capture this love of cars but distort it into what they thought the younger generation wanted. I’ll be direct, were talking about Pimp My Ride. From an economic standpoint, it,did well. But aside from the memes that have come from this visual disaster, it had no redeeming qualities for the car guy. Why did it miss the mark entirely? In America, I hear producers try to focus on the desire to modify our cars. That is a good premise, but I have yet to meet someone who actually wants to put a fish tank in their glove box. The problem with Pimp My Ride is the problem with laminate wood flooring. Its utter crap. Overhaulin’ is likely the best not-Top Gear, car modifying show on television. They take cars with legitimate value and restore them in a way that any petrol head would love. Unless you don’t like Foose wheels, then you’ll be disappointed. At any rate, the paint is done right, the parts are purposeful, and there are no aquariums. Its like winning the lottery if your a middle aged muscle car guy. Going beyond the restorations, the show has little else. It still lacks entertainment. It lacks…. racing and shenanigans. So while the show is very good at building a car, it becomes repetitive and disinteresting. Top Gear had gimmicks and scripting just like any other show. There really is no way to improvise anything of real quality otherwise. Yet these scripts were able to say or do just about anything to every make and model without impunity. That cannot be said of many shows that produce consistent positive reviews of even the most atrocious cars. Top Gear didn’t depend on the funding of auto manufactures and product advertisement to carry on. We all watched because we like criticism. Even misplaced, overzealous criticism feels real in the face of dissonance between perpetual optimism of lesser shows and good reasoning. So we will miss Top Gear UK because it worked and it worked on a global scale. I hypothesize that Top Gear could have in fact brought about world peace. According to a Canadian article, Top Gear was aired in 214 countries. Which is interesting because there are only 196 nations in the world, meaning either people can’t do math, or Top Gear had outlasted governments and borders. Yet there is still hope for global harmony as Netflix has signed up the trio, even bringing along their producer Andy Wilman. If I was a praying man, I would certainly be giving thanks to some omniscient automotive deity. 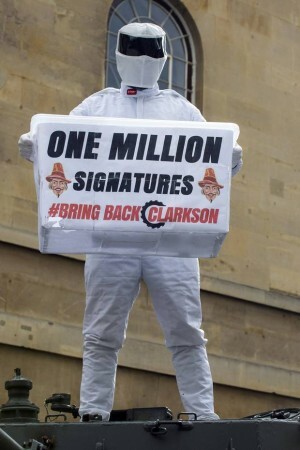 Only time will tell if the second coming of Clarkson et al. will live up to its own expectations. In the meantime, I suppose we should get out to the garage and actually spend time with our cars. Slayer of chemical equations, master of the horseless carriage, and purveyor of fine motorsports.